Providing a pallet clearance and pallet recycling service that is second to none, here at Alpha Pallets we have established ourselves as one of Northampton and Milton Keynes' leading names in the industry. We pride ourselves on ensuring your unwanted pallets are 100% recycled, and if they have any value at all then we will pay you for them with either cash, cheque, Bacs or as credit against new pallets. As a reputable and trusted supplier of pallet recycling services we are of course Waste Carrier License holders, and as such we provide a Duty of Care notice for all of our collections. This ensures you can relax safe in the knowledge that your pallets are being disposed of safely and responsibly. The stripped down pallets are then cut to size for use in new pallets, as well as for pallet repair which we also specialise in. Our pallet repairs service is much more cost effective than buying new or reconditioned ones, so if you have broken pallets make Alpha Pallets your first port-of-call. Research conducted in the USA found that the average used wood pallet was in fact 13% stronger than those made from new wood. Here at Alpha Pallets we serve clients within both Northampton and Milton Keynes as well as the surrounding areas. 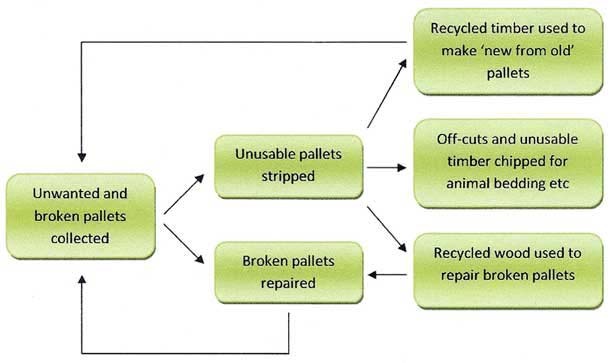 To find out more about pallet repairs and recycling, give us a call on 01604 230579.